The Project includes 184 hotel rooms, 184 condominium units and extensive visitor facilities, including restaurants, spa, three swimming pools, and a conference center on 39 acres of coastal sand dunes in Sand City. Sand City is the lead agency. The project site is governed by the 2002 Sand City General Plan and 1986 Local Coastal Plan. The Coastal Commission staff recommended approval with conditions (147K PDF file) in April 2014. The Commission revised and weakened many of conditions in response to the developer’s requested edits. The Commission added the one significant strengthening condition that required a revised Habitat Protection Plan for review and approval by the Executive Director. 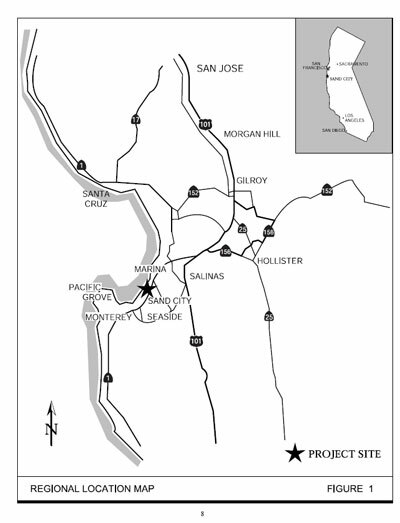 In January 2009, Sand City approves the applicant’s EIR addendum. In February, the MPWMD board denies the applicant’s water distribution permit and requires a subsequent environmental impact report on the water resort’s water supply. In March, the Coastal Commission postpones its hearing on Monterey Bay Shores at the applicant’s request. In December, the Coastal Commission denies permit to the resort. An Addendum to the Final Environmental Impact Report (18.7M PDF file) was circulated in October 2008. 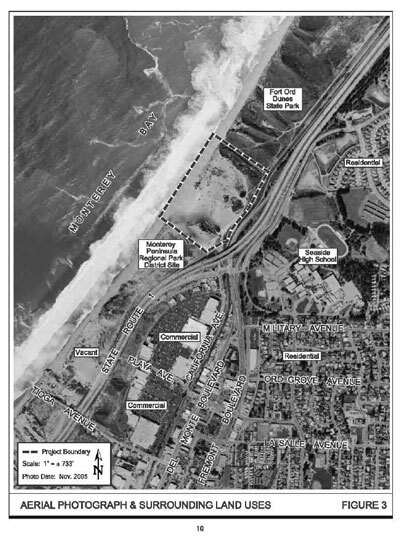 In 2008, the applicant submits revised development plans for a 341-unit resort, to the Coastal Commission and Sand City. In May, the Appellate Court overturns the Coastal Commission’s 2001 decision, ordering the commission to reconsider the applicant’s revised permit application. In December, the applicant distributes a lengthy addendum to the 1998 EIR. The Sierra Club withdraws its lawsuit against Sand City and the Final EIR is certified in 2002. At the end of 2000, the Coastal Commission denies the applicant’s development permit. In December 1998, Sand City approves the applicant’s coastal development permit for a 495-unit resort and certifies the EIR. The Sierra Club appeals to the Coastal Commission. In 1996, State and regional park agencies enter into an agreement with Sand City leaders, known as the “Coastal Peace Accord.” The document sets most of Sand City’s 1.5 mile coastline as open space, except for two “building envelopes,” including the area owned by Security National Guaranty. Zoning for the parcel for “visitor serving uses” was approved by the Coastal Commission in 1986. The proposed Monterey Bay Shores project in the town of Sand City. The proposed Monterey Bay Shores includes a hotel, condos and an extensive visitor services area. The Western Snowy Plover, a federally threatened species, is documented as using the site and adjacent beach and dunes for breeding, feeding, and raising its broods for at least the past 25 years. This development coupled with coastal erosion and sea level rise will reduce the Plover’s available habitat. The project was based on an outdated Local Coastal Plan (LCP) certified by the Coastal Commission in 1986, but never subject to any significant updates. The 1986 LCP failed to identify any significant environmentally sensitive habitat areas (ESHA). Sand City Eco-Resort, Resolution on Foreclosure?